In the early morning April 15, 2018, a strong line of storms dropped 2 to 3 in. of rain on the the Washington, D.C., area. Just a few hours later, flash flooding alerts plagued the news. The morning commute brought nightmare traffic, and highway high-occupancy vehicle lanes shut down due to standing water, leaving cars at a standstill for hours on interstates 95 and 395. Some drivers even had to be rescued when rising floodwaters trapped them in their vehicles for long periods of time. During this chaos, the situation underground was much more controlled, thanks to the first major component of the DC Clean Rivers Program, which was put into service only three weeks earlier. The new 225-million-gal-per-day (mgd) wet weather treatment facility at the Blue Plains Advanced Wastewater Treatment Plant and a 7-mile-long tunnel segment worked together to prevent an estimated 170 million gal of sewage-laden storm water from pouring into the Anacostia River. Similar to many older cities on the East Coast, one-third of DC Water’s service area uses older combined sewer systems that carry both sanitary sewage and storm water. These systems were constructed in the late 19th and early 20th centuries. At the time, a combined network was thought to be an efficient design because it allowed for a natural flushing of the system whenever it rained. In contrast, sewer systems built at the same time in the western part of the country, which did not have the benefit of frequent, year-round storms, had to rely on manual flushing events, which were costly undertakings. The effects of climate change and the steady increase in larger and more intense storms, combined with the proliferation of impervious surfaces over the last 100 years, have rendered combined sewer systems largely inadequate. During heavy wet weather events, storm water runoff can overwhelm the collection system and treatment facilities with a diluted mix. In Washington, D.C.’s case, the combined sewer overflow (CSO) was approximately 90% storm water and 10% sanitary sewage, which was flowing into the Anacostia and Potomac Rivers. The bar screens were tested prior to grouting in the guide frames. The April 2018 storm was an ideal test of Washington, D.C.’s new facilities. The $215 million wet weather treatment facilities-a paired tunnel dewatering pump station and enhanced clarification facility (ECF) designed and built by a PC Construction and CDM Smith joint venture-can receive and treat up to 225 million gal of CSO. The storm water’s journey begins 100 ft below the Blue Plains Advanced Wastewater Treatment Plant (AWWTP) by entering the TDPS facility via a 76-ft-diameter, 150-ft-deep shaft that functions as a surge and screen chamber. This shaft contains a rock trap and coarse bar screens, and mitigates surging flow in the tunnel while protecting downstream pumps from objects larger than 3 in. Following the coarse bar screen, the CSO flows through a 13-ft-diameter pump suction manifold contained within the larger second shaft. The initial pumping capacity is 250 mgd, with the capability for expansion to 500 mgd. Five 3,000-hp electric pumps, each rated at approximately 83.3 mgd, were installed as part of this first phase, with provisions to add three more pumps in the future. 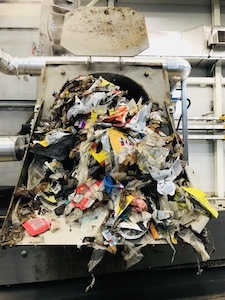 Once the flow is pumped to surface level, it enters the 225-mgd ECF, which utilizes 6-mm fine screens, a vortex grit removal system and a ballasted high-rate clarification process to settle solids prior to disinfection and discharge. The ECF contains three high-rate clarifiers, each capable of treating 83.3 mgd, making it the largest high-rate clarification installation in the world. The process coagulates particles in the water with ferric chloride and then flocculates them with polymer with microsand embedded in the nucleus of the floc. This results in the formation of robust flocs that act as a ballast, significantly increasing settling velocity and decreasing sedimentation time. The settled floc is pumped from the bottom of the tanks and sent through hydrocyclones to separate the sand from the sludge. The sand is reused in the process and the sludge pumped to the main plant for additional treatment. The high settling rate of the microsand-ballasted floc results in a compact system footprint. For the dilute flow, these processes achieve a level of treatment approaching secondary quality. The addition of ferric also removes phosphorus, thereby protecting the river from a key nutrient in the discharge that would cause detrimental algal growth. This is achieved reliably with a quick start-up time and without reducing the operational efficiency of the plant’s main treatment trains. After water passes through the clarifiers, there are two options for final treatment that are based on permit requirements and main plant influent flow rates. If the system is in initial start-up or the main plant is not at its rated capacity for complete treatment, then water is sent from the ECF system to the main plant’s secondary process for continued treatment. 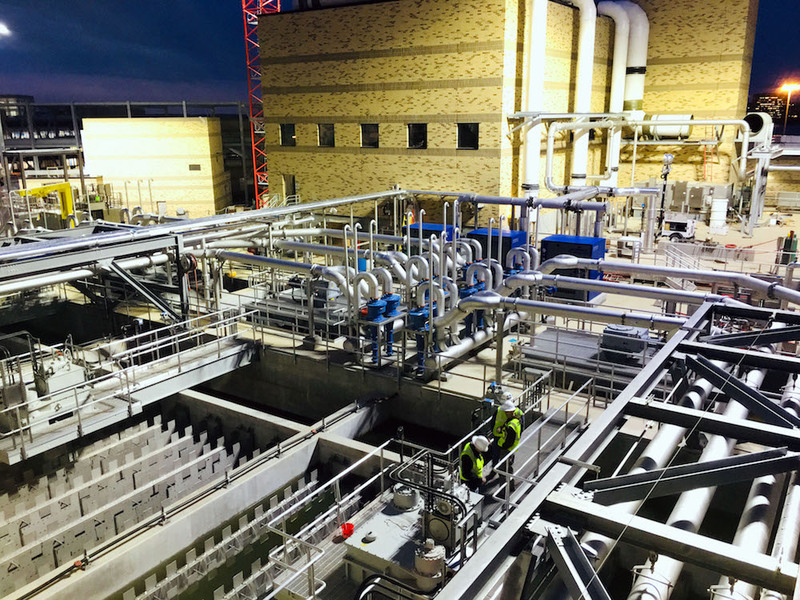 After initial start-up and when the plant is at its complete treatment capacity, the high-rate chlorination and dechlorination systems are activated. At this point, treated ECF water in excess of the plant’s complete treatment capacity is sent to the chlorine contact and dechlorination tanks prior to being discharged to the Potomac River over a drop that entrains oxygen as it flows to the river. The extent of aeration achieved varies with the tidal elevation in the river. After each event, the system begins a flushing cycle to prepare for final shutdown. The chlorination tanks hold more than 2 million gal of treated water, which then is used to completely flush the tanks, equipment and piping to prepare for shutdown between storm events. The CSO flowed into the Anacostia and Potomac rivers. DC Water has installed an integrated data collection and monitoring system for the Anacostia CSOs to provide critical, real-time observations from the collection system. The system incorporates a variety of field instruments, such as rain gauges and flowmeters, to observe and transmit data to the Blue Plains AWWTP, enabling greater preparation and information on CSOs. This project will allow DC Water to quickly ramp-up and treat peak wet weather flow immediately during a storm. With this first phase complete, DC Water will begin mining the next tunnel segment for the Anacostia River. Upon the full project’s anticipated completion in 2023, the entire tunnel system will capture 98% of sewage overflows into the Anacostia in an average year of rainfall and provide more flood relief for residents who were served by an undersized sewer for decades.